The Mombasa Golden Starburst Baboon Spider has a tough attitude, and a tough constitution! 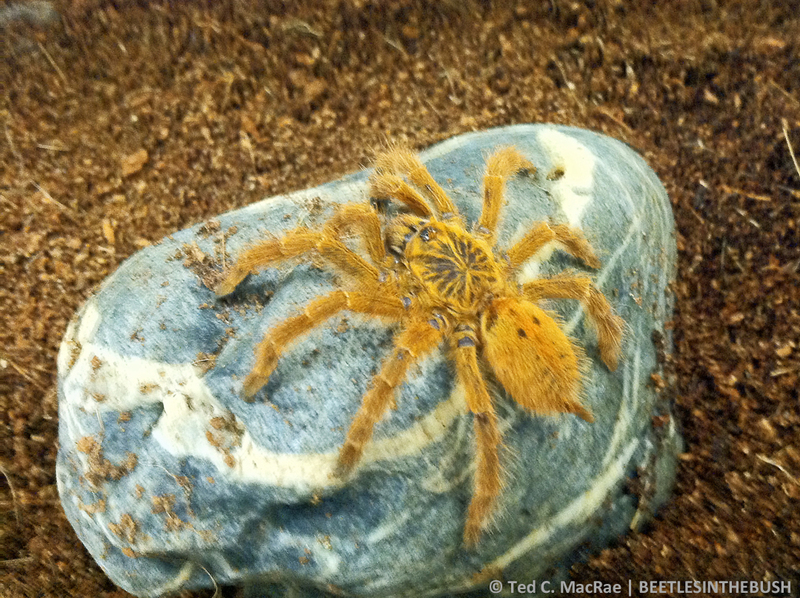 The Mombasa Golden Starburst Baboon Spider Pterinochilus murinus is a very handsome African tarantula. Coming from the dry savanna scrublands, it is very hardy and adaptable in captivity. Overall they are golden shade with their namesake starburst pattern on the carapace, but there are variations in their coloring. They can range from tan to a bright gold. These variants are thought to be accorded to each tarantula's geographic location, and possibly related to the type of soil found there. Although the Mombasa Baboon Spider is one of the most common African tarantulas available, there are numerous color morphs. Many specimens that are available may not actually be this particular species of Pterinochilus. The name Starburst Baboon Spider actually encompass several species that were imported during the 1990s from Africa. They all have the typical body form but vary in color from grays and black, to pale mustard yellow to bright orange. Taxonomy is no doubt confusing and is in flux these days. The most popular specimens seem to be the bright golden orange specimens. Common names you will find these specimens under include Starburst Baboon Spider, Mombasa Golden Starburst Tarantula, Mombasa Golden Starburst Baboon Spider, Orange Baboon Tarantula, Usambara Orange Baboon, and even the tongue in cheek name "Pterror," a pun on its attitude and Latin genus. The Mombasa Golden Starburst Baboon Spider is a terrestrial species that can live just about anywhere. They tend to be a burrowing spider if the conditions support this, lining their burrow with silk. If the substrate is not adequate for a burrow they will construct their webs anywhere they can. This spider is very fast and aggressive. If it is provoked it will readily display and bite. It should not be handled under any circumstances, and a bite can be medically significant for some people. Yet despite its aggressive nature, it will readily mate. Habitat: Distribution/BackgroundThe Mombasa Golden Starburst Baboon Spider Pterinochilus murinus was described by Reginald Innes Pocock in 1897. They are an "old world" African tarantula found in Zaire, Kenya, and Tanzania. Other common names they are known by are Starburst Baboon Spider, Mombasa Golden Starburst Tarantula, Mombasa Golden Starburst Baboon Spider, Orange Baboon Tarantula, Usambara Orange Baboon, and "Pterror". StatusThe Pterinochilus murinus are not on the IUCN Red List for Endangered Species. Description The true Sunburst Baboon Spider is bright mustard yellow with clean, dark markings. These markings include the characteristic starburst pattern on the cephalothora. 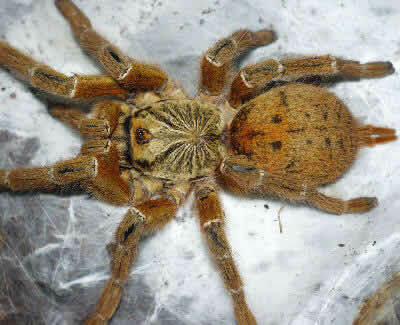 Mombasa Golden Starburst Baboon Spiders are medium sized with up to a 6" (15 cm) leg span. Mature males, however, molt out at a very small size usually in the 2 - 3" (5 - 7.5 cm) range. Males are slender and long-legged compared to females and they have no tibial hooks for mating. These spiders are fast growers, a male can mature in under a year with females taking a little longer. They are not as long lived as some of the other tarantulas, having a probably life span of only about 8 to 12 years. Food and FeedingIn the wild their prey includes insects, lizards, mice, and other small animals. In captivity the Mombasa Golden Starburst Baboon Spider will do well on a diverse diet consisting of adult crickets, grasshoppers, Tenebrio larvae, and only occasional feedings (once or twice a month) of mice. HousingThe Mombasa Golden Starburst Baboon Spiders live in heavily webbed burrows and are probably one of the most opportunistic of the Theraphosids. They are found in bushes and low trees, in burrows under rocks, in vacated animal burrows, under dog houses and sidewalks, and near human habitation. They commonly find a suitable opening and line it with large sheets of web. As they grow, they add exit holes and often an area to pick up vibrations or to funnel passing prey into close proximity. This species can be maintained at about at 77° to 86° F and a humidity of 40 to 60%. They are native to the drier regions of east Africa so need less moisture than many tarantulas. It is reported that even a moist substrate can affect them adversely. Behavior This spider is very fast and aggressive. If it is provoked it will readily display and bite. In general tarantulas do best if they are housed singly and this works as well for Mombasa Golden Starburst Baboon Spiders. But despite their tough attitude with humans, they will readily mate. Handling This species is very aggressive / defensive and should not be handled under any circumstances. The bite can be medically significant for some people. We suggest using a paint brush or other tool to corral the Baboon Spider and to move it from enclosure to enclosure for cleaning, maintenance, or for breeding attempts. Reproduction The Mombasa Golden Starburst Baboon Spider has proven very easy to breed in captivity. As with most Pterinochilus species, mature males molt out quite small compared to females. They are usually only in the 2 to 3" (5 - 7.5 cm) range. They are slender and long-legged compared to females and they have no tibial hooks for mating. This size difference ultimately leads to their demise post-mating. Adult males should be carefully introduced into the female's enclosure after he has produced a sperm web. The male can be protected with a piece of cardboard or other tool if he is to be used for further breeding attempts. Once mating occurs, the female should be fed more heavily and a variety of prey items. Females tend to be very protective of their egg sacs and the young. Their egg sacs hold up well and hatch without much "motherly" attention, simply resting in a hammock in the female's webbed enclosure. Egg sacs commonly contain between 75 and 100 spiderlings that hatch in about five weeks. Often a second egg sac will be produced in a few months without an additional mating, this is called 'double-clutching'. Once hatched the spiderlings are easily raised. They are hardy and grow quickly. Availability Baboon Spiders, and especially the genus Pterinochilus, have proven to be very hardy and quite prolific in captivity. Many species of Starburst Baboons are available on a regular basis by tarantula suppliers. R. Conniff, "Tarantulas: Earth Tigers and Bird Spiders", National Geographic, Sept. 1996, pp. 98-115. There's lots of information on the Mombasa Baboon Spider page above, with foods and feeding, housing, cage care, ailments and more. I just got an OBT - a little over 3' from tip of right front to tip of left back leg and stocky so I presume a still juvenile female. I have her in a 10G aquarium with 4-6' of shredded coconut husk for bedding and a Y-shaped cork round leading down into the bedding for a natural hide. She stays in my office, which is typical office heating during the winter and cooling during the summer. The lights are on when I am there and off when I am not. Should I add any supplemental lighting or heat? Perhaps a day/night light? Specific recommendations would be greatly appreciated. She is VERY skittish to vibration or touch but not approach; I am really looking forward to watching her over the next several years (hopefully). Here is a photo of her. Wow, she's a real pretty little lady! What are some specific characteristics of its web? what circumstances does it spin them. This type of spider lives in a heavily webbed burrow. It will build a tunnel in the substrate and much of its time there. The substrate needs to be at least 4 - 5 inches (10-12 cm) deep, even up 8 inches (20 cm). substrates can be made up of a peat moss/soil mix, coconut mulch, or an invertebrate mix. If you want less substrate, you can provide adequate shelter with a piece of driftwood that has a cave type opening or a piece of hollow bamboo, or even a paper towel roll can work. Don't let the enclosure get too damp, as they don't like excessive humidity. Keeping humidity levels between 40-60% works fine for keeping them hydrated. My friend has one named gloria and it's really surprising to read how aggresive they are. I don't know about you but it's the laziest pet in the house and hasn't displayed any aggresive behavior to the hundreds of people who've handled it in the 2-3 months he's had it. I hope it's not sick or anything. It's like if you own a tiger. It might not be aggressive if it's been taught to be around humans, and it's well fed, but one day it might have fear or his instincts might get stronger and, pop, it will attack. So long as the tarantula is eating on a weekly basis & the colors & hair look vibrant & fuzzy it should be ok mine is very lazy unless it involves food or making someone back away because he does not like to be messed with, if you have any questions please let me know I have been raising & caring for tarantulas of all kinds for 21 years so please ask away I do not mind at all. Cudny agree more. Wen i got mine wuz told it wuz a texas brown,next time i went 2 take her out she had morphed in 2 a hairy alien like m-f duzny stop me from handling her doh. . . . . . . . . . . . . She b a friendly dude,also have 2 boas 2 pythons hoo live 2 gether wuz told not a good idea no 1 told dem dat,have bin living 2gether 4 6 months now,same tng bout corn snakes have 6 living very happy 2gether. .